Two islands make up the popular holiday destination, which for all intents and purposes is a backpacker's paradise. Fisherman double as tour guides, and simple beach bars spill out onto the pristine shore. Travellers have the option of securing more high-end accommodation if they want, though the islands are an iconic stop on the budget traveller's itinerary. Regarding activities, the largely undeveloped region is located within the Terengganu Marine Park, where divers and snorkelers can enjoy clean water and gorgeous coral reefs. 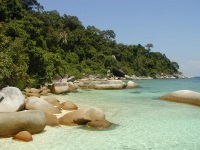 Visitors can reach the islands via taxi boats from the town of Kuala Besut. They should also note that the east-coast monsoon often makes the islands inaccessible between November and January.